In the second article about the critical period Five Points South is going through right now, the above image should give everyone pause. It seems not too long ago, this little strip mall on the 1900 block of 11th Avenue South was home to a longtime hairdresser, hot dog stand, and convenience store, as well as an H and R Block. The convenience store remains, but the hot dog stand is closed and cardboard boxes and rear ends of display cases block the plate glass. A vacant storefront has a “This is not parking for restaurants” sign menacingly scrawled, amidst other cheaply done, temporary signage. In fact, the cacophony of old and new signage, “temporary” banners and posters, and the overall complete lack of street presence makes this surely one of the most shameful urban presentations in Five Points. If ever there was an example of the need for a redevelopment authority, which years ago could have acquired this property and solicited for redevelopment more appropriate for the neighborhood, this is it. As it is, the property and its tenants have really sunk to a new low, and it’s depressing. I mean, Bail Bonds? In the middle of Five Points? Not exactly the image we’d like to convey in the metro’s center for dining and nightlife. On a more positive note, the local merchants (and there are many wonderful merchants who keep us optimistic about the place) have formed a committee to address “immediate tasks and long term goals” for the area. There’s a piece in the Birmingham Business Journal on this announcement here. let's densify the edge and connect it with bike paths! So far the main complaint I have about the park is the lack of sidewalks bordering it on 1st Avenue South (hopefully they are coming soon!?!). Oh, and one more complaint–that greenways/bike lanes aren’t already in place making it easy to reach this incredible space from across the city by bike. Regardless, I’ve been there almost every day or night enjoying it (walking or biking from home), and it looks like the rest of the City is too. That gives me hope after a grim meet-up with “James Bond” up the street. This entry was posted in Uncategorized and tagged Bail Bonds, Bike lanes, Design Review Committee, Five Points South, Railroad Park, sidewalks, Tom Leader. Bookmark the permalink. I’m curious about those sidewalks along 1st Ave. S. as well. During a tour, the planners said that there would be another row of trees, the sidewalk, and parallel parking, which would surely push the southern edge of the park out into the street. (It’s plenty wide there, so losing some asphalt wouldn’t affect traffic.) 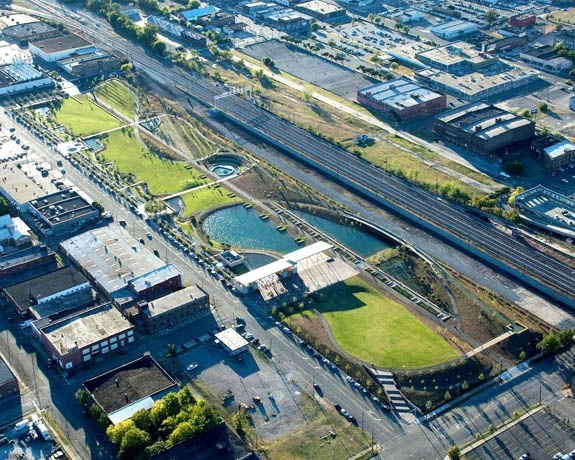 That would also help align the park with the future greenway down the 1st Ave. S. railroad cut. I wonder how soon all of that will happen. Charles, that’s my understanding of the plan as well. It sounds lovely–but I’ve yet to hear a definitive time for this to happen. Hopefully someone knowledgeable could share that information with us. Thanks. i noticed this on my way to work one day – how sad. I used to get my hair cut at that salon – for $6! and it’s just across the street from the beautiful southside baptist church as well! I used to call 5 Pts S my 87th St Bridge Song place and took my children there often after dark for ice cream at Goren’s. It was a delightful, friendly place, and it was safe to be there anytime, day or night. There was a great diversity of people walking around or sitting on the benches, but all were nice and pretty much well-behaved. Music flowed out the doors of the many establishments offering live music. We really loved the fall festival. Now it seems that the majority of the people who hang out at 5 pts are derelicts, who are pretty scary looking. They are sitting all around the fountain and down the streets, and make nasty comments when you walk past to go to your car. My children are now grown, but I wouldn’t take my grandchildren there. It isn’t safe for families any longer. And they probably do need a seedy bail bond store down there now. It breaks my heart. Really it does. I hope something can be done to bring it back to what it was. Well, sometimes these things go in cycles–let’s hope it can’t get worse than it is, and we can prepare for an upswing! I’m confident it could be done with good, coordinated planning. 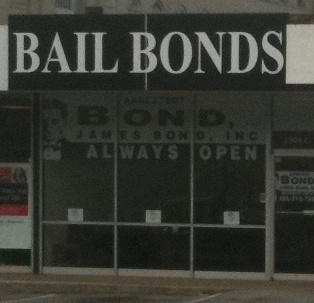 I haven’t driven along 11th Avenue South in the last little while, but Holy Cow, I would have had a small fit if I’d seen the Bail Bonds sign in Five Points. I consider that a sign of a certain kind of degradation– Five Points isn’t even close to the Courthouse or the Jail! I’ve seen Mr. Bond’s billboards– who is this? He’s bound to have money, to have billboards and a place in Five Points. This makes me sad and uneasy. Could the city use zoning to prevent something such as a Bail Bondsman in an area that should be retail, restaurants and entertainment? Zoning could also be helpful in restricting certain kinds of businesses in the Downtown area. Is that kind of thing possible? I’m not sure if that’s possible to “discriminate” against that type of business through zoning or other ordinances, but I sure wish it were. That type of business has a right to exist, of course. The real key could be if there were a master plan with merchant support, and a list of “preferred” business types, and instead of individual landowners taking whoever rents the space, there would be a coordinated rental effort that could help prevent this sort of thing. 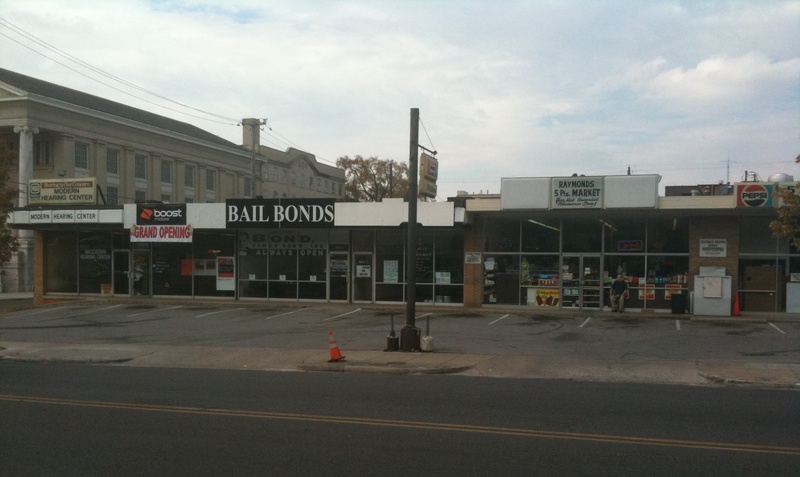 I do not understand why anyone would want to place a Bail Bonds facility here. I thought these type of businesses locate close to the jails. Why 5-Points? I don’t know how much jail space they have, but the Southside police precinct is right up the street from the Five Points Bail Bond store. It is my understanding that the sidewalks will be funded through the Congestion Mitigation and Air Quality Improvement (CMAQ) Program. The plans I have seen do have an additional row of trees as well as a healthy sidewalk. It will push out significantly into the existing right-of-way and should set up nicely for the developments across the street. As far as timing, I understand we should see some progress at the end of this year or the beginning of next. Thanks for this very good information. We can’t wait to see this sidewalk happen–not only for practical reasons, but to illustrate how a truly wide, gracious, well designed urban sidewalk can (hopefully) help stimulate development across the street! I am curious why there was such a big deal made over Chick-fil-a and then they allowed the Bail Bonds to open. One will bring business the other will deter business. Brittany, indeed a lot of people are a little incredulous that this Bail Bonds slipped in. I wish I had a good answer for you but I don’t. At the very least it seems like the signage would’ve been required to be a lot less conspicuous. But it does give one the impression that we were all asleep at the switch when they moved in. Anyone who knows more about this situation please share some info with us. Thanks. the city can only review/approve what is submitted for permitting. If nothing is submitted then it is very easy for something to ‘pop up’. Churnock–if indeed the City never got to review this, then you are right it’s easy for it to “pop up”. The City does not have the resources to constantly rove through town, checking on things, so if anyone sees a sign or paint job or renovation that looks suspicious, please alert me or the City Planning department and we’ll get it checked out. Thanks. Even though his parking lot is always empty, and the bldg space next door is unoccupied, this guy will come running out of his silly little store to monitor the parking lot. Sad.